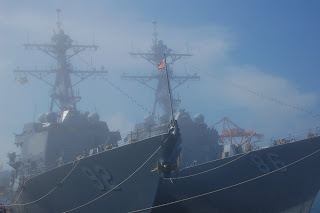 The USS Momsen and USS Shoup are US Navy destroyers of the Arleigh Burke class. They recently visited Seattle during Seafair for public tours. Individually, these destroyers are impressively fortified and armed. But consider that there are 55 of them commissioned, and they are only a small component of the larger Navy. It would be challenging to outspend the US on a better equipped military.